The sticker in the snow. I love the snow; in West Virginia where this image was taken snow is a fleeting thing. Itll snow some then quickly disappear. As a matter of fact not that snow is rare but it only happens a few times during the cold winters. The common teasel, which this is an image of takes to the snow almost perfectly. It blows into its spines and is held there. If you ever get into a patch of them it definitely will be something you remember for quite some time. The thorns on the body of the stalk can be quite sharp. 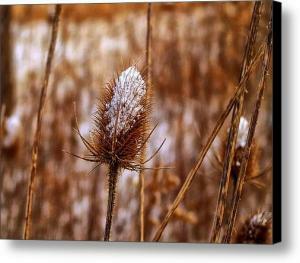 At any rate we had drove around on this snowy day for quite some time when we came across this patch of common teasel. I found it unique that most of the snow in the surrounding areas has melted away but in the thorns of this plant and its patch they remained. I find it Interesting that they are a weed and without a doubt attempt to take over any area that they inhabit killing off and native vegetation. With that said the plants are an important food for goldfinches in the winter. Man uses teasels in the floral industries and previous to the 20th century they were used to raise the nap on material such as wool. Today with the exception of their use in decorative fall pieces, they are considered a weed by most and cut down and destroyed when the opportunity arises. This patch was not intentionally planted or if it was at one time the patch has grown wild and has taken on the characteristics of a wild weed. I do see some extraordinary beauty in the plant and its overall patch. Call me strange but it is interesting that the seed head can hold snow like it does when all around it snow melts. Weed or not it helps set the scene for a great winter shot.